The car stopped in front of Ganma and Ganpa’s house. It was dark. Dada lifted me out of the car chair and set me on the snow. I walked to the house which had many lights on. Ganpa opened the door to let us in. Inside there was noise and people. He and Mama took off my boots, coat and hat. From the door, I could see a big tree with many lights on it. There were strings of candy canes and a star up, up on top. There were presents under the tree and many colors. Ganpa held my hand and walked me around the tree. He showed me another little tree that kept changing colors and a snowman who did the same. It was dark in the room, but then we walked into the light where I saw Ganma and other people standing. We went to a big table which had food and bottles on it and there was a choo-choo going. It kept going round and round on the table. Ganpa put me on his lap and I could see a small town of houses and people smiling who did not move. 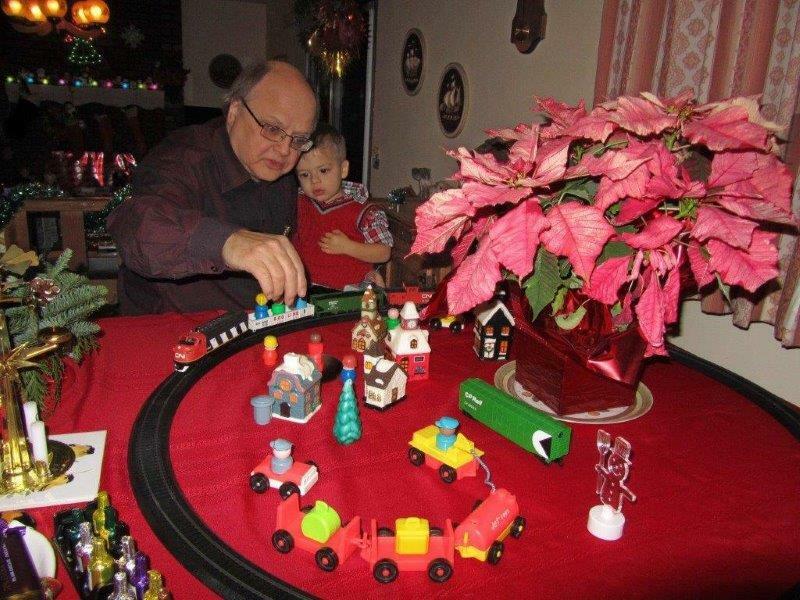 He let me turn a dial which made the choo-choo stop, slow down, go faster or go backwards! It was a cool train! 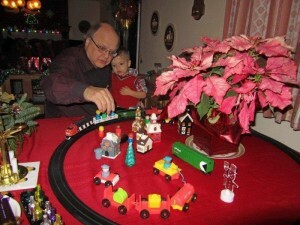 He and me put cases and small people on and off on one car, then made the choo-choo go again. When it stopped, I said “Again”. Then he was carrying me down some steps toward some lights in another room. He showed me a big window and two deer with lights moving in the snow outside. I said “Brrr” because I know it’s not warm outside. We looked at a fire on tv, and I said “Hot, no touch” like Mama told me. There were boats on pictures, snowmen, a big star, and Santas too. On the floor were some puzzles which I started to play with, pushing out the pieces through holes. Then, I started to put them back where they belonged. Later Gandpa showed me the fridge and there was a big picture there which looked like crayons. He said I did it. I saw a picture of Ganma and went to the chair where Ganma sat to say “Ganma” and point to her in the picture. When I wanted to play with her and pulled on her leg when she was standing in the kitchen, she said she was busy and didn’t come with me. There were lots of snacks on the table and I helped myself to some, taking them back to Mama in the big tree room. I didn’t have too much supper, but drank from a bottle of water. (No cup.) It was fun. After, Ganpa showed me white dogs and yellow birds that moved and played music. I liked the dog who played piano and Ganpa and I danced on the floor to the song. He also showed me how to pick up icicles from the rug to put back on the tree. I had a lot of fun and opened up a few presents. There was a truck I put balls into which flew out another hole in the truck as it went. It was a good day. I said “Bye” to everybody and waved when Dada and Mama put my clothes on to go out into the Brr, cold again and the car.